First of all, the cover for this book is gorgeous. And the stone she is holding kinda looks like a heart, so it is creepy and beautiful at the same time. I am a fan of the colors- the purples, blacks, and pinks. Chantress starts immediately with action. We aren't given much background information going into the story. Typically- I really dislike this way of starting a story, but the author did a great job of grabbing hold of me as a reader without causing me too much confusion. I would say that the first fourth of the book and the last fourth of the book held all the action. I think this was a bit of a weakness - I found myself getting bored and trying not to skim read through the middle. The parts of action where Lucy was in danger were exciting and exhilarating. The author excels at writing high action scenes. I am not sure why this book is being pumped up as a romantic book. It isn't. Not to say that there isn't romance in it- there is a slight romance storyline, but it is absolutely not one of the main focuses of the book. I went into the book thinking there was some sort of epic romance, and it was sorely lacking. Now, this is not to say that it was a bad book- not at all. But it is wise to go into this book thinking it is alternate history or fantasy- not as a romance. The small amount of romance that was there was slow building and in no way insta-love. I am suspecting that there will be a sequel based on the ending of this book- it isn't clear cut and obvious but the storyline is left open. There is a ton left to write about - so many characters that are still shrouded in mystery. I really do hope that the author explores them more. 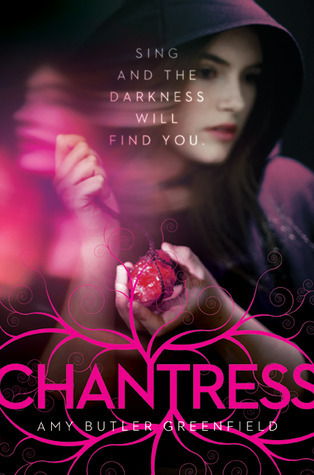 Chantress was an enjoyable read. Though it had some parts that dragged, the ending made up for the slower parts. Chantress would be enjoyed by middle grade readers and fans of fantasy (especially historical fantasy). I will be looking forward to more books about these characters!